These intermediate exercises pinpoint target areas to build overall chest muscle. The first installment of our progressive chest workouts focused on functionality throughout the shoulder girdle. If you can consistently do those beginner-level exercises with proper technique and stability, then it’s time to level up, says Carlisle Price, national manager of coaching for Gold’s Gym. Upper-body functionality is a by-product of control and stability. As you perform the following exercises, keep those fundamentals top of mind — they set you up to build chest muscle. This workout incorporates classic pushing moves, free weights to promote stability, isolated movements to build chest muscle and exercises that boost whole-body synergy. Price suggests doing this workout twice a week, with two to three rest days in between. Remember to breathe and stay focused on proper form. Perform two sets of the following exercises to increase your heart rate, get the fluid around your shoulders moving and help prevent injury by priming your muscles for the work ahead. Start in plank position. Then, push through your palms and raise your hips toward the ceiling for downward-facing dog, creating a straight line from hips to hands. Hold for one count. Bend your elbows to lower your head toward your hands; then, push your upper body forward and up until your arms are fully extended and your lower body is hovering just above the floor. The only things in contact with the floor are your palms and toes — this is called upward-facing dog. The range of motion is big, and the movement is fluid; imagine sliding your head and shoulders under a wire. Finally, lift hips again, rocking back to plank. “With the dive bomber, we’re moving in a vertical nature with our arms and shoulders,” Price says. The goal: Do eight to 12 controlled reps to stretch the posterior chain (hamstrings, calves, glutes) and activate the shoulder girdle, lats and triceps. From plank position, lift your right hand and foot and move them six inches to the right. Then, follow with your left hand and foot to return to plank. Repeat. Your hands should be directly beneath your shoulders; if they drift forward or back, pause to bring your hips into alignment. “With this walk, we’re starting to move laterally, hitting a different plane of motion for the shoulder and getting every angle worked before we start the workout,” he says. The goal: Maintaining a straight line from head to heels, take 10 “steps” in each direction to activate shoulder-stabilizing muscles and build stability in the core. Price recommends doing three to four sets of superset No. 1 and four to five sets of superset No. 2. Using a functional selectorized resistance machine, begin with your back to the machine with one foot in front of the other for balance. Take the handles that are located mid-level on the machine, or, if the machine has pulleys, adjust them so that they are about chest level. Grasp a handle in each hand with your arms extended out to the sides. Pull your hands toward each other, maintaining a proud chest and a slight bend in the elbows throughout the movement. Be careful not to lose tension in the pectorals by letting the shoulders round forward. Slowly return to the open starting position. Price suggests starting with 10 to 15 pounds of weight. If you’re not fatigued after the first set, add 5 to 10 more pounds on your next set. Continue this trend until you find the max weight you can pull while maintaining proper form. The goal: Do 12 to 15 reps to work the pectoral muscles and anterior deltoids (shoulder muscles). Stand facing a sturdy wall. With a soft bend in the knees, hold a 10-pound medicine ball with both hands and extend your arms straight out in front of your chest. The ball should be about six inches from the wall. Bring the ball back to your chest, keeping your elbows close to your ribs; then, explosively push the ball toward the wall. It should leave your hands momentarily, bounce off the wall and return to your hands. Control the ball back to your chest and reset if needed. If the ball bounces back closer to your stomach than your chest, move a few inches nearer the wall. The goal: Do 20 passes to feel the move in your pecs, deltoids and triceps. Try a heavier ball if you don’t feel fatigue in the front of the shoulder at the end of the set. Lie on a flat bench with dumbbells in each hand; elbows should be at about a 45-degree angle away from your torso. With chest proud and forearms vertical, extend your arms, pushing the weights toward the ceiling. Return to the starting position slowly and with control. Experiment to determine the right weight. Price says a good starting point is 20 to 25 pounds for men and 15 pounds for women. As with the cable flys, add 5 to 10 pounds after each set until you hit the sweet spot — between fatigue and form — to build chest muscle. The goal: Do 8 to 10 reps to work the pectoral muscles, anterior deltoids and triceps. Start in plank position with feet hip-width apart. Lower your chest until your elbows are bent at 90 degrees, keeping them within 45 degrees of your torso. Hold this position for at least 15 seconds, maintaining a straight line from head to heels. Core work definitely comes into play here. 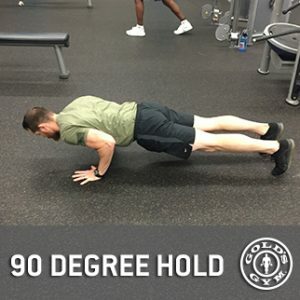 “You’re getting tension literally everywhere with this exercise, but you’ll feel it most in the targeted areas — chest, shoulder, triceps,” Price says. The goal: Work up to holding the position for 30 seconds with perfect form. Don’t forget to cool down! It gets blood flowing to the muscles you just worked and helps lessen next-day stiffness. Price says large arm circles — slow and controlled, five in each direction — are particularly beneficial after this workout. Reach out through your fingertips, taking 8 to 10 seconds for each rotation.